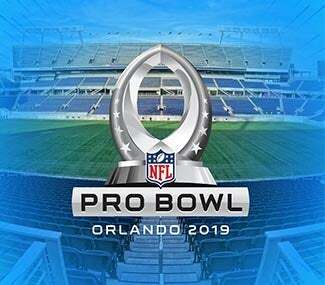 The 2019 NFL Pro Bowl presented by Verizon will return to Camping World Stadium in Orlando on Sunday, January 27, 2019 at 3:00 PM! Tickets are on sale now! The Pro Bowl will also be televised on ESPN, ESPN Deportes and simulcast on ABC. Fans in attendance will be presented with a special pre-game opportunity to see the Pro Bowl players as they enter the stadium, bringing them closer than ever to the All-Stars on the field. Family priced sections, concession deals, and “Kid Zone” activities will be available inside the stadium and there will be specific AFC and NFC section seating for fans to cheer for their favorite players. Special prizes will be given out during the game, including a grand prize Super Bowl package to be presented to the Pro Bowl “All-Star Fan” at Camping World Stadium. Fans will also enjoy a post-game fireworks show to cap off the celebration. On the televised broadcast, viewers will be treated to unique player access, featuring mic-ed up players along with social media usage from the sidelines. Pro Bowl Week festivities in Orlando will include the NFL Flag Championships powered by USA Football, which will culminate live on ESPN/ABC on Pro Bowl Sunday; the announcement of the prestigious Don Shula NFL High School Coach of the Year Award; and the NFL Pro Bowl Experience, a free football festival located at the ESPN Wide World of Sports Complex at Walt Disney World Resort, where fans will also have fan access to AFC and NFC team practices. In addition, Pro Bowl Week will include the return of the Pro Bowl Skills Showdown, testing the athletic prowess of All-Stars from each conference in unique competitions.